What will the result of AFC Bournemouth v Cardiff City be? Eddie Howe has confirmed that the Cherries' record signing Jefferson Lerma will not make his debut against the Bluebirds. The Colombian midfielder is not yet up to speed having only recently returned to the Vitality Stadium after featuring at the World Cup in Russia. Nathan Ake looks set to be fit for the hosts having being substituted early on in Bournemouth's pre-season friendly with Marseille last week. But Howe has confirmed that Junior Stanislas and Kyle Taylor will miss the visit of the Bluebirds. As for Cardiff, he will be without midfielder Harry Arter who is ineligible to face his parent club having joined the Bluebirds on a season-long deal from Bournemouth on transfer deadline day. But elsewhere, he is expected to have a fully fit squad to choose from following the pre-season knocks suffered by right-back Lee Peltier and central midfielder Aron Gunnarsson. The Bluebirds' other deadline day signing Victor Camarasa is in contention to feature, although he perhaps seems likely to start on the bench. AFC Bournemouth is a professional football club in Bournemouth, Dorset, that plays in the Premier League, the top tier of the English football league system. Formed in 1890 as Boscombe St. John's Institute F.C., the club adopted their current name in 1972. Nicknamed The Cherries, since 1910 Bournemouth have played their home games at Dean Court. Their home colours are red and black striped shirts, with black shorts and socks. AFC Bournemouth have won the second and third tiers of English football, and were twice runners up of the fourth tier. They have also won the Football League Trophy, and the Football League Third Division South Cup. Bournemouth have spent the majority of their history bouncing between the third and fourth tier of English football. Under manager Eddie Howe, they have risen through the pyramid; the 2015–16 season was AFC Bournemouth's first ever in England's top division. We last played Bournemouth in a Championship match back in 2015. 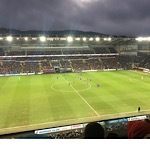 The match at Cardiff City Stadium finished 1-1 with Bruno Manga equalising after Harry Arter had opened the scoring the visitors. "For an idea that does not first seem insane, there is no hope." I would take a point now. Any point away from home is a good point in this league. Get the first point on the board then move on. 1-1 and am being optimistic unless we get a few more signings. Kevin Friend has been selected as the referee for AFC Bournemouth v Cardiff City on Saturday. He will be assisted by Matthew Wilkes and Mark Scholes, with Graham Scott acting as fourth official. They've just spent 25m on midfielder from lavente today! I see us losing badly here. They are a very mobile unit. Shame their stadium is of conference size too as several of us would have loved a ticket !!! * The Vitality Stadium, home of AFC Bournemouth, is the smallest stadium in the Premier League, with a maximum attendance of 11,360. * City and Bournemouth have played two pre-season matches since their last competitive match. The Bluebirds beat the Cherries, 3-2, in 2015 before a single Jordon Ibe goal separated the two sides in 2016. * AFC Bournemouth Manager Eddie Howe has guided the Club to four promotions since 2008. After winning promotion from League Two, he had a spell as Burnley manager for 18 months before returning to Dean Court (the Vitality Stadium) in October 2012 to guide the team from League One to the Premier League. Be a tough game for Cardiff ! I predict either a loss or a draw. I personally believe a draw will be a good result but some people seem to think we are more than certern to win this game. Its away for a start against a good team! Bournemouth will want to get off to a good start too and they’ve spent abit of money. A draw will be a fantastic start ...a win phenomenal. Good luck to Neil Warnock and the team today! This season could launch Zahore's career to a new higher level if he's in the right mindset. He's potentially the football equivalent of Jonah Lomu i.e. massive physique but with speed and skill. If Warnock can make him believe in his talent we could have a 20 goal a season premier league striker worth £30-£40 million. For this reason I'm going for City to win 0-1. Zahore to score! When is the 25 announced? Stairway to Merthyr wrote: This season could launch Zahore's career to a new higher level if he's in the right mindset. He's potentially the football equivalent of Jonah Lomu i.e. massive physique but with speed and skill. If Warnock can make him believe in his talent we could have a 20 goal a season premier league striker worth £30-£40 million. Just for reference only 4 players scored 20 goals or more last season. Salah, Kane, Vardy and Aguero. I would be surprised to see any of our squad reach double figures for goals.